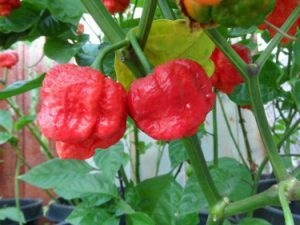 Skunk Chocolate-(Capsicum chinense)-The Skunk Chocolate pepper is mean hot pepper variety developed by master Italian grower Rocco Maltesi. It is a cross between the MA Wartryx (created by Matthew Arthur) and the 7 Pot CARDI strain. 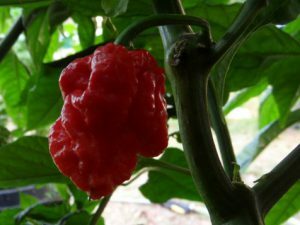 The 7 Pot CARDI strain being the original official 7 Pot pepper from Trinidad. 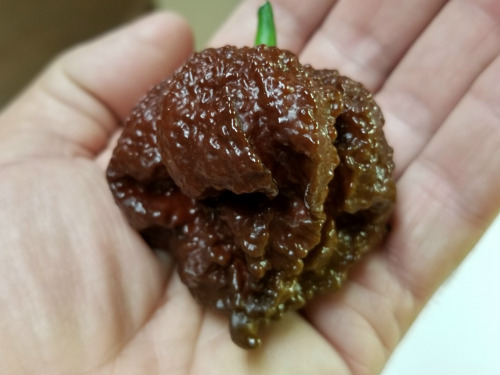 The result of this cross are mean extremely bumpy huge superhot peppers that sometimes have a scorpion like tail. I have gotten some so huge that they almost fill up the palm of my hand! 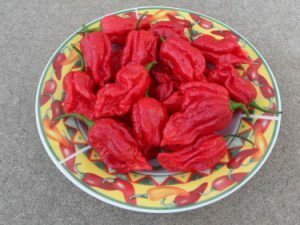 The Skunk Chocolate chile plants seem to produce larger peppers than it’s red relative and more tails on the peppers. However the Skunk Red is more productive. The flavor is somewhat fruity but smoky in the Skunk Chocolate. 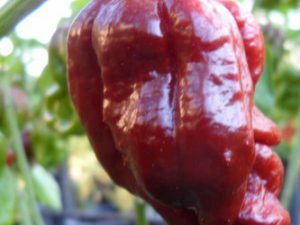 The Skunk Chocolate Chile plants grow up to 5 feet tall.